Ochaduke (or chaduke) is green tea over rice. This simple dish is favored by Japanese as a light meal, or a midnight snack. 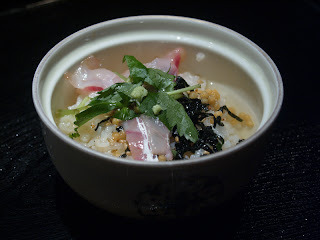 Rice is often served with green tea or bonito broth, and some topppings. Toppings may include salmon flakes, sliced raw fish (red snapper), tsukemono (Japanese pickled vegetables) and grilled bits of rice cake. One of most popular chaduke is Tai chaduke (red snapper chaduke). sliced raw red snapper is usually served with white sesame paste. You put all the toppings over rice, then add hot green tea (or bonito borth) over the top. Ochaduke is very light, yet tasty. It can be cooked by using a leftover of rice from dinner. One is located at the Narita airport (Terminal 1). You may want to have it for your breakfast if you have a morning flight.